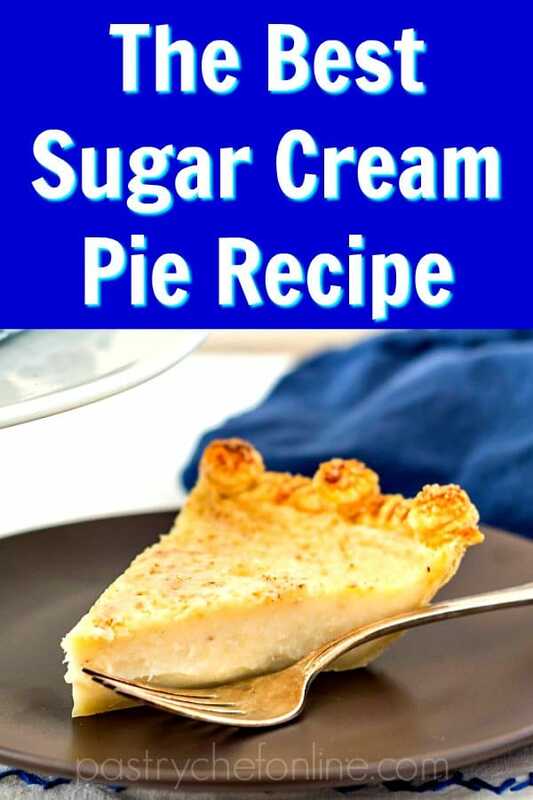 I’m glad you’re here, and I’m excited to share the Indiana Sugar Cream Pie recipe with you! It’s the fourth and last in my “Throwback Thursday Food” series of Heritage Pies or “Use What You Have” Pies. Click to find more old fashioned pie recipes. 2 What Does Indiana Sugar Cream Pie Taste Like? 3 What Is Dan Quayle’s Recipe for Sugar Cream Pie? 5 Can You Make Sugar Cream Pie with Half and Half? 6 Should I Refrigerate Sugar Cream Pie? Everyone loves a fruit pie, but back in the days before IQF (individually quick frozen) fruit and bags of all sorts of nuts on the shelves year round, early Americans made pie of whatever they could get their hands on. Some people call them “make do” pies or Depression Pies, but I go with “Use What You Have” pies. Whatever you call them, these are the pies folks made when they either couldn’t afford fruits and/or nuts or they weren’t in season. These are the Dead of Winter pies made with regional staples. Folks on farms had access to milk, cream, butter, and eggs. Even when refined sugar was expensive, most people had a jug of molasses or sorghum. And everyone had a bag or a bin or a sack of flour. From these humble staple ingredients, creative cooks dreamed up some damn fine pies. Use what you have, or “desperation pies,” include sorghum custard, shoo fly, chocolate chess, and sugar cream. 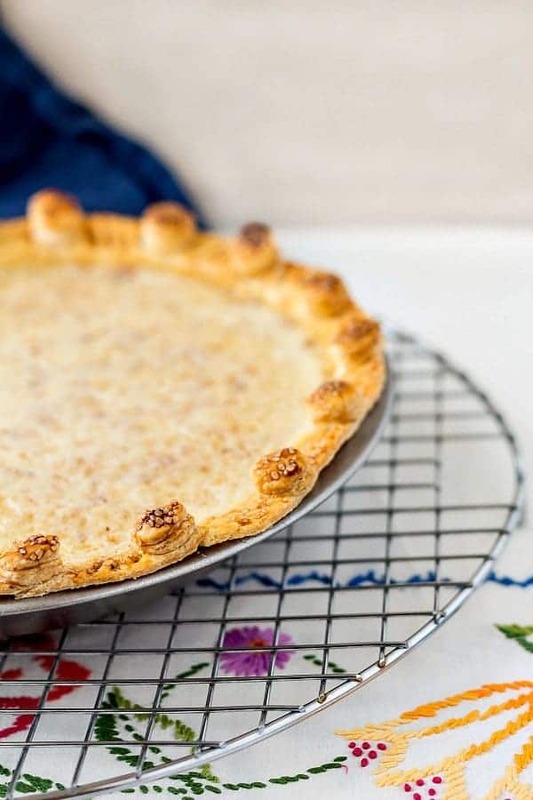 Indiana Sugar Cream Pie–you’re here! You can see I did a different crust treatment for each pie. I get bored easily! What Does Indiana Sugar Cream Pie Taste Like? Knowing what I know about “use what you have pies,” I’d have to say that lots of folks in Indiana had year-round access to cream and sugar. I’m almost a little surprised there’s no egg in it since I figure if you’ve got access to cows, you probably have access to chickens. Egg lends richness and also tends to add their own mellow yet distinctive taste, but it can muddy the taste of the cream. 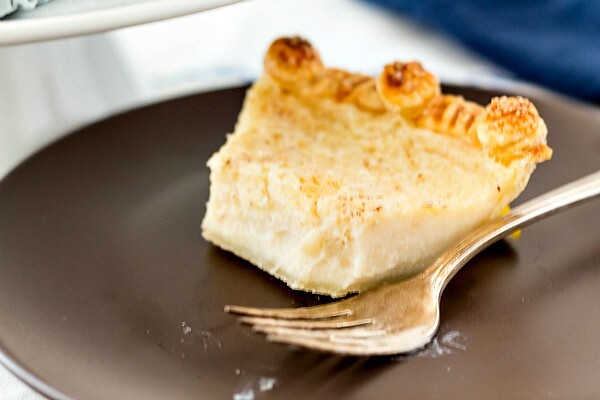 With eggs out of the picture, Indiana Sugar Cream Pie (also called Hoosier Pie) tastes of sweetened cream. Do use the best cream you can find because the flavor will shine through. Now is not the time for generic store brand cream since it is the predominant flavor. Splurge on the organic stuff for this guy. What Is Dan Quayle’s Recipe for Sugar Cream Pie? I looked through a ton of Indiana Sugar Cream Pie Recipes. Some used cream and half and half, a couple used whole milk (but really? It’s called Sugar Cream Pie…). A couple of fillings were cooked on the stove top and then poured into the pre-baked crust to set up in the fridge. There were a lot of variations. Believe it or not, the one I followed most closely is from Dan Quayle. Yes, that Dan Quayle. Here’s the recipe attributed to him on the site Feed Me That. Sugar Cream Pie slices like a dream and would be a pie to serve fo the holidays, especially when dusted with nutmeg. Granted, I haven’t had all the kinds of sugar cream pie that are out there, but this is the one I made and I think it’s pretty excellent. So I’m calling it “best.” Here’s the rundown of how to make it. Line the pie pan with your crust. Freeze. 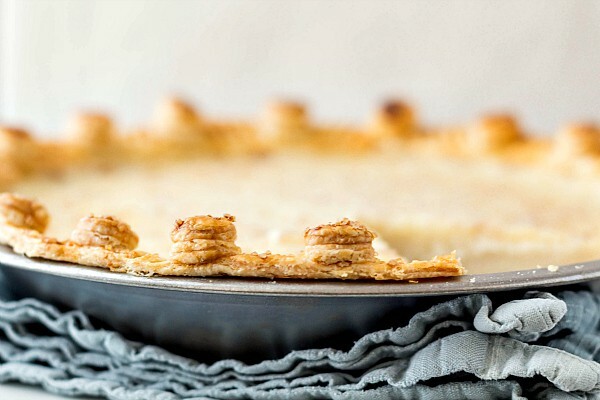 Freezing the pie crust before filling and baking helps to ensure your crust won’t shrink or slump in the oven. (More information on keeping your pie crust from shrinking). Mix up filling. Add butter and nutmeg to the crust. The filling is as easy to make as whisking it all together in a bowl. Dan Quayle says to put pats of butter and nutmeg on the bottom of the crust before filling, so that’s what I did. Stir the filling during baking. This step keeps the flour in the mix from rising up and baking into a cake layer on the top of the pie. Stir about 10 minutes into baking to make sure the batter stays together. Dust finished pie with nutmeg. A simple pie like sugar cream only needs simple garnish. A little grating of fresh nutmeg or a sprinkle of cinnamon is a lowkey, eays and homey way to finish off this Indiana classic. Can You Make Sugar Cream Pie with Half and Half? 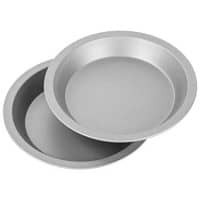 evaporated milk–I have not tried with evaporated milk, but my bet is you’ll have to reduce the amount of flour since there is less liquid in evaporated milk. The flavor will be very different, and you really won’t be able to call it sugar cream pie, but if it’s all you have, it’s worth a shot. 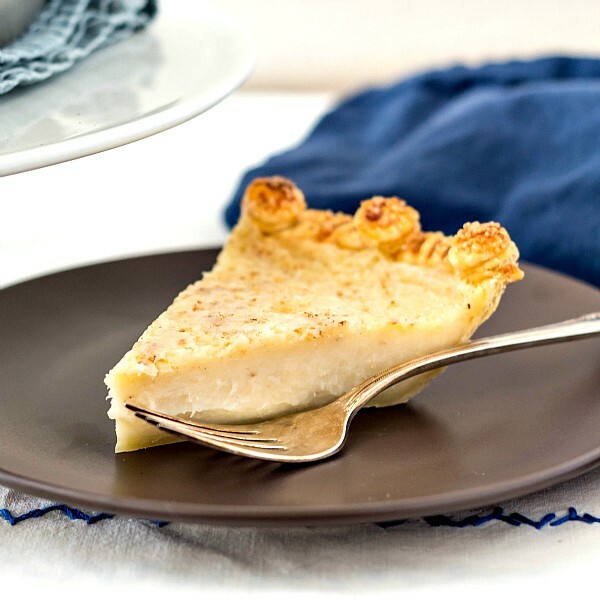 Buttermilk–if you use buttermilk, you’ll be making buttermilk pie. Since most commercial buttermilk is lowfat, I would add an egg for richness. Again, I haven’t tried to make sugar cream pie with any other dairy substitutes, so I’m giving you my best guess. Should I Refrigerate Sugar Cream Pie? Even though Hoosier pie doesn’t contain any eggs, it still should be refrigerated to chill and for storage since it contains so much dairy. 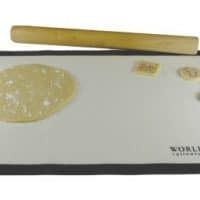 For serving, the flavor will be better at cool room temperature, so slice the pie and put the pieces on individual plates about 45 minutes before you plan to serve it. That way, there will be plenty of time to take the chill off. The way you finish off your crust is entirely up to you and is a great way to let your creativity shine through. If you love pies that originated (or perfected) in the midwest, you can’t do better than Hoosier Mama Pies. And there’s a cookbook, too. 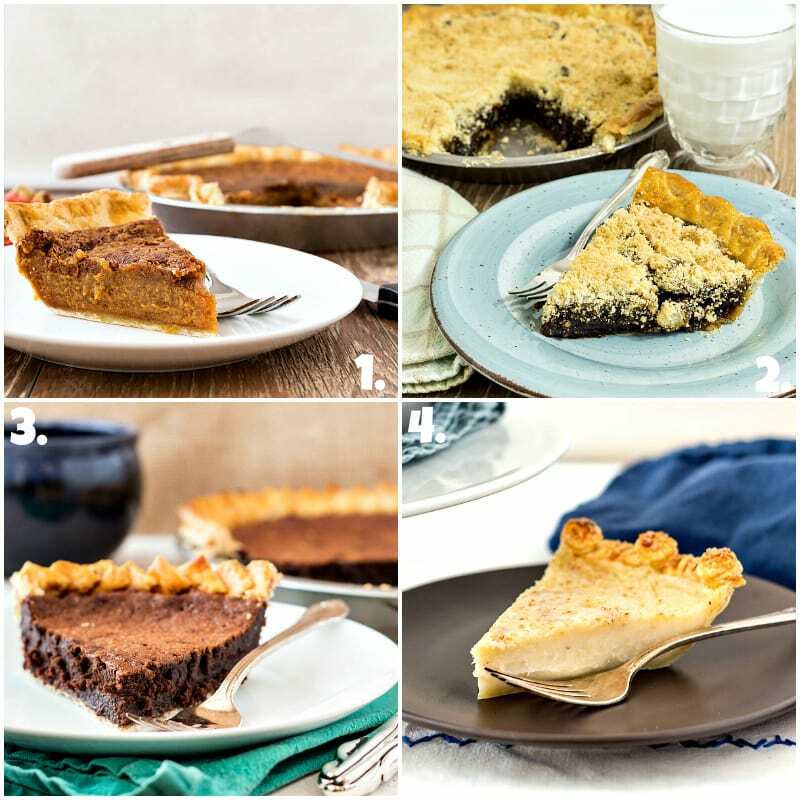 You may want to check out Paula Haney’s take on Hoosier Pie. 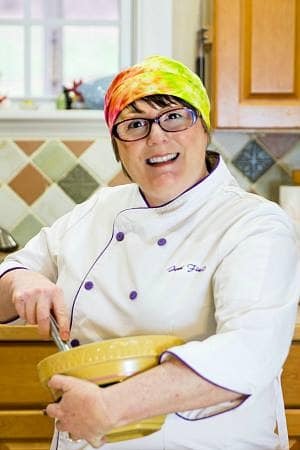 She’s a midwestern pie master! Indiana Sugar Cream Pie is rich but not overly so since it doesn't contain eggs. 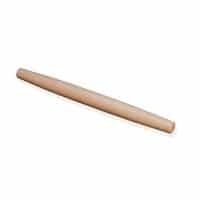 It is flavored with vanilla and nutmeg, so it's somewhat reminiscent of eggnog without the egg part. Use the best cream you can find and use freshly grated whole nutmeg. The flavor is worth it. About 30 minutes before baking, preheat the oven to 425F. In a bowl, whisk together the cream, milk and vanilla. In another bowl, whisk together the flour, sugar and salt. Slowly whisk the milk mixture into the flour mixture until you have a smoothly combined and very loose "batter." Grate some nutmeg evenly over the bottom of the frozen crust. Maybe 1/2 teaspoon altogether. Cut the butter into bits and scatter evenly across the bottom of the pie. Whisk the batter again very well to make sure it hasn't separated any and then pour it into the crust on top of the butter and nutmeg. Some of each will float, and that's okay. Carefully place the pie on the center rack. Bake for 10 minutes. Open the oven door and stir the filling really well with a fork. Be careful not to get over-enthused and bust into the crust with your fork. Mix well more or less in the middle of the pie, and stir "shallowly" so you don't hit the bottom crust and tear it. Doing this ensures that the pie won't set up with an almost cake-like layer on top and a gooey layer underneath. Turn the heat down to 325F and continue baking the pie until it just barely jiggles in the center when shaken, about 30-35 minutes. The Dan Quayle recipe suggests you shake the pie every 8 minutes, so I did. I'm not sure it's strictly necessary, but who am I to argue with Dan Quayle? Cover the pie loosely with a large piece of foil once the crust is as golden brown as you want it. When the pie is done, remove it to a cooling rack. Evenly grate some more nutmeg over the whole pie--maybe another 1/2 teaspoon. If you're not a nutmeg fan, I'm sure it would be okay to use cinnamon. I won't tell Dan if you don't. Serve chilled, slightly warm or at room temperature. Store leftovers in the fridge. This pie would be lovely with some fruit compote, but it is also fantastic alone. The flavor is very clean and light. Good stuff! Thank you so much for spending some time with me today. Enjoy the pie, and have a lovely day. My family is from Indiana and sugar cream pie is a huge part of my childhood! There was a place in Winchester, IN that we use to go to called Mrs. Wicks. BEST PIES! This looks perfect and how I remember. As I was looking up different recipes and doing some research on this pie, the name Mrs. Wick’s kept popping up again and again! I hope you give this version a try. I’ve never had another to compare it to, but it is pretty yummy! They do have great pies. My wife and I grew up in Randolph county, IN. I wish I had grown up with this pie. I have a lot of catching up to do, Max! Mrs Wick’s are the best! I love them right out of the freezer! I live in Texas but always have lunch and pie at Mrs Wicks when I am in In. One day I will have an piece of authentic Mrs. Wick’s! I’ve heard so many good things! I’m not Mrs. Wicks, but I hope I’ve done it justice, Carmerlina! Good luck, and let me know how it turns out! Happy Thanksgiving to you and your family! What did I do wrong?! :'( I’ve been so excited to make this pie, but it’s currently been in the oven for probably double the time the recipe calls for and is not setting–still just as jiggly as when I put it in. Anyone else have this problem or any idea where I went wrong? My sugar cream pie craving goes on…. Oh, no, Melissa! I wonder if maybe your oven is running cold? It does need to get up to a certain temperature for the starches to set up. Another possibility: you added 2.25 oz flour by volume, which is closer to 1/4 cup. You need 2.25 oz by weight, or 1/2 cup of flour. Can you tell me exactly what you did and I’ll see if I can help you pinpoint it? I want you to satisfy your sugar cream pie craving! Second attempt, and I’m hoping it was successful!!! I think where I went wrong last time was that I dumped my dry ingredients into my liquid ingredients rather than slowly adding the milk to the flour mixture as the recipe states. Seems to have made a difference this time! I just hope I added enough sugar–did about 7/8 cup, so we will see tomorrow when we taste it! Fingers crossed for a perfect pie! Thanks, Sandi! I think you could dress it up by using a stencil when you dust on some spices. Super easy plus elegant enough for a dinner party. Score! This is so fascinating! I love hearing about these regional dishes. It totally makes sense to use whatever you have when fruit wasn’t in season. 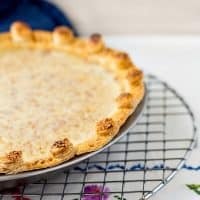 This creamy pie sounds amazing, so I’ll definitely give it a try! It really is delicious. I am glad we can get fruit for pie pretty much year round these days, but man are these desperation pies Good!